LEDs are used to show the logical high RX (green) and TX (red) signals. 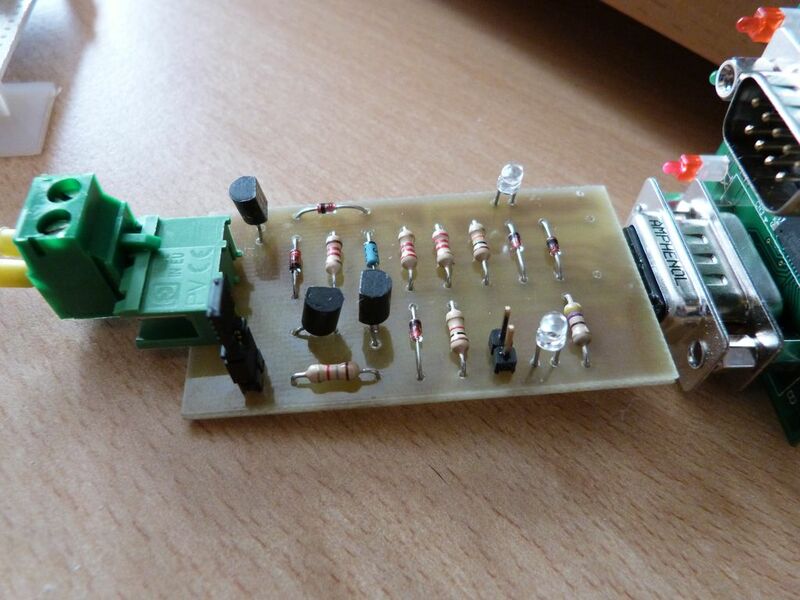 The components used are very common, they are not particularly critical, the circuit is feasible with the material that every electronic hobbyist has in the drawer. The operation of the circuit has been tested to a transmission rate of 250 kbaud for sections of short length. It has also been tested with the 1-wire network on a cable length of 100 meters with 8 (eight) DS18B20 sensors, powered by the same RS232 serial port. The auxiliary power supply is derived from the signals “DTR” and “RTS”, held at the high logic state. As can be seen from the schematic, the circuit is very simple. The output stage, connected to the TX of RS 232, is composed of R3 (base current of Q3), DS8 (protection negative voltage), Q3 (output driver) and DZ3 (regulator output voltage limiter or voltage input). DZ3 may have different values of zener: when used with TTL levels should be 5.1 volts, when used with other logic levels can be 3.3 or 12 volts. The resistor R5 is the resistance that brings power to output and must be calculated in relation to the zener DZ3, the milliampere available on the RS232 driver and the external devices that we want to power. The diodes DS1 and DS6 bring the voltage available on the signals “DTR” and “RTS” (when at high level) to the circuit composed of the capacitor C1, R5 and DZ3. The diode DZ2 polarizes Q1 and Q2 to the right voltage which activates a high logic level signal onto RX of RS232. R1 keeps the RX signal to zero volts when Q1 is off or when Q2 is enabled. When at side B is received a signal at the logical level zero, through R4 the current flows into the base of Q1 that starts to conduct and leads to a high level signal onto RX of RS232 port. JP1 = ON, in this case the RX and TX are in common and it is the situation that occurs in the 1-wire bus, which is a half-duplex bus. The green LED1 displays the status of the high signal RX and red LED2 displays the status of TX. 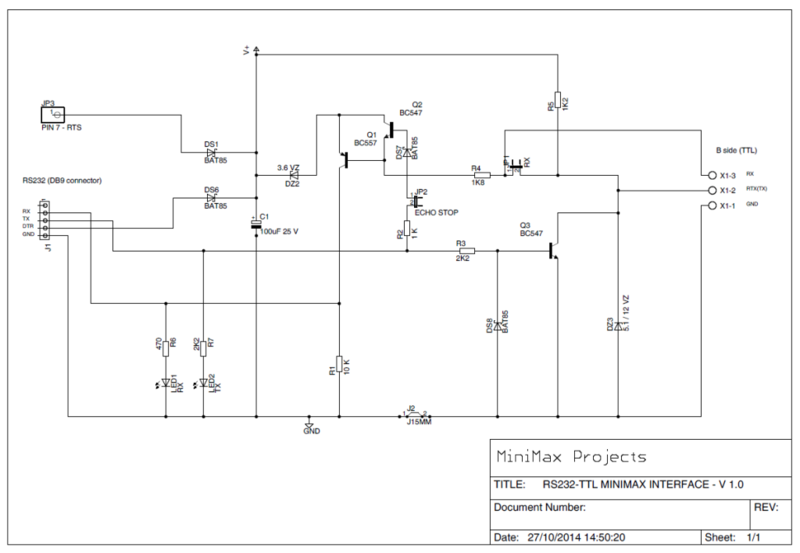 RS232 TTL MiniMax multiform interface – Schematic – Please always refer to the downloadable PDF for further updates not reported in the pictures. RS232 TTL MiniMax multiform interface – PCB with components – Please always refer to the downloadable PDF for further updates not reported in the pictures. And here the very prototype. Note that in this picture the DB9 connector J1 is soldered on bottom side / copper side of the board, but this is a weird prototype. Following the scheme, you’ll guess that the correct mounting way is to embed the PCB between the two rows of pins of the connector, making the pins corresponding to soldering places. The five-pins row obviously must be turned to copper side, and in top side it must be placed JP3 in order to connect itself to the pin 7 of the DB9 connector. You should (and PCB is designed to) use 1 x pin header strip (90° angle, 2.54mm pitch). Editor’s note: original files are not available here. If you need any of them (schematic, pcb layout, BOM et cetera) please leave a comment with a valid email address and we will send it to you asap. If you find any inaccuracies or errors in the projects, documents and texts, they were probably made to give you the opportunity to report them to us and make us realize that we can make mistakes and we ignore many things. The TTL -> RS232 circuit isn’t clear. 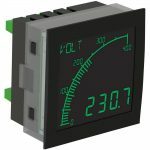 Low level for RS-232 (actually meaning “1”) is from -3 to -12V, not 0V. The voltage from -3 to +3V is the undetermined state, like from 0.8 to 2V for TTL. Even if zero voltage works as “1” for you, it’s no guarantee this will work for every RS-232 port. your notes are the truth about the “out of standard” RS232 levels. The circuit is intentionally made in that way, to keep the component count at the lowest level possible with the maximum possibility of connection (minimax). Surely some RS232 ports will not function reliably and others will not power the boards an connected IC, but the majority of RS232 tested works fine, thanks to IC manufacture enlarged spec., also when the environment is noisy. This circuit is also made for the DIY world and the “poor man” student and experimenter, surely not for industrial or critical uses. 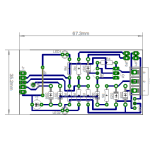 We will add a note to the circuit description about RS232 “out of standard” spec. Hi David, I just updated this old post fixing the links. Please update your browser (also with CTRL+F5) to view the (no longer) missing images. Thank you. Hi Sergio, I’ve sent them via email. Thank you, regards.